Store garlic in a cool, well-ventilate area. Do not store it in the refrigerator or below 10°C or it will sprout. In general, ideal setting is 13°C to 14°C; similar conditions of a good wine cellar. Nonetheless, garlic keeps rather well under a wide range of conditions, including ambient room temperature. Allicin, responsible for the flavour and therapeutic benefits in garlic, is not present in whole garlic heads or cloves. It is created when enzymes and sulfur compounds collide through processes such as chopping, crushing, cutting and chewing the garlic. 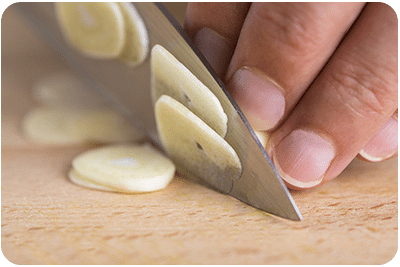 Heat destroys allicin, but chopping or crushing garlic before heating creates rich, complex flavours. In numerous cuisines such as sauces, stews, curries, and stir-fries, chopping or crushing garlic and then cooking it in oil is a fundamental culinary building block. Chopping or crushing garlic generates aromatic flavours, and cooking it in oil enhances its character and helps distribute its flavours.